The BMW Z3 was cute. The first-generation BMW Z4 was not cute; it wasn’t really anything good at all, stylistically speaking. The current Z4, code name E89, is hugely gorgeous. In June 2011, the Z4 was also hugely successful. Sales accelerated at a 120% clip, year-over-year, and the Z4 easily beat its main rivals: the Audi TT, Mercedes-Benz SLK, Porsche Boxster, and Porsche Cayman. 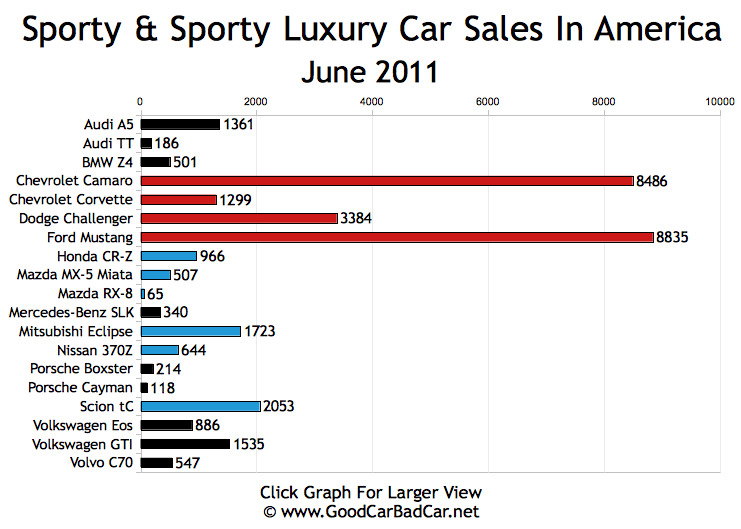 The Z4 is also way out in front year-to-date, as well, with 2034 sales in the first half of 2011. 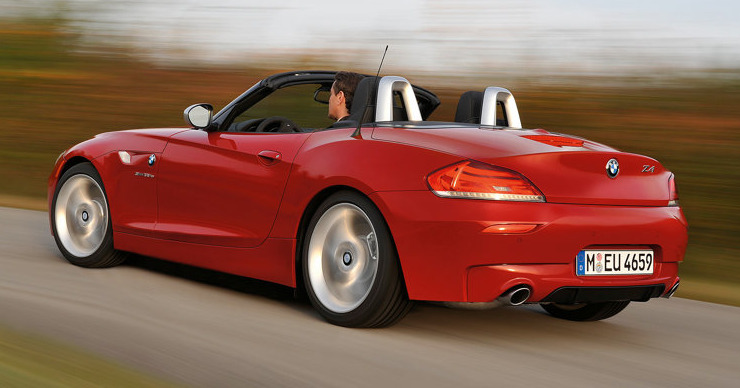 The 2011 BMW Z4 sDrive30i has a base price $47,450. The Ford Mustang, on the other hand, is really truly hugely successful. Priced from $22,310, the Mustang came out just ahead of the Chevrolet Camaro in June. The bad news? The Mustang trails the Camaro by 9720 sales in the first six months of 2011. Sales also fell 1.5% in June and are down 2.5% this year. Both the Mustang and Camaro were on America’s list of 20 best-selling cars last month, too. 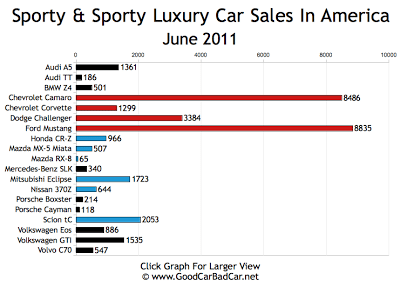 Rivals of the Z4, Mustang, Camaro, both direct and indirect, are in the sports car sales chart below. Though Cayman, Boxster, and Panamera sales slid in June, the Porsche 911 was perfectly healthy. June sales rose 10%; the 911 sales are up 13% in 2011. Sales of the BMW 6-Series nearly doubled up on June 2010’s total. Even Jaguar was able to report huge 48% XK gains. The XK accounted for 19% of all Jaguar sales, up from 11% at this time last year. Sales of the most-expensive Audi are accelerating as quickly as an R8 with go-pedal pressed. 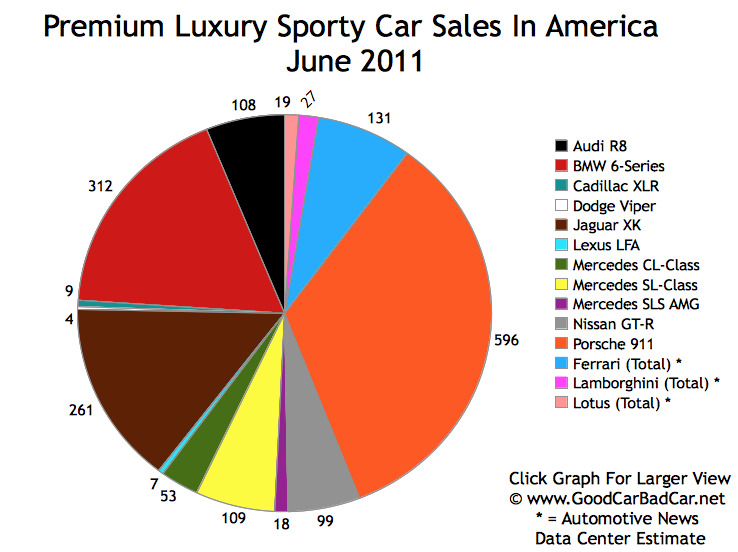 Up 209% in June and 143% this year, the R8 out-sold the freakin’ SL-Class Benz, the symbol of status.